Order Your Black FMB Shoes Now! Here's some vendors that sell drillmaster shoes, links to their site, and prices. You will need your black Drillmasters by Friday, September 5. Please order soon so you have them in time. Most vendors sell shoes at a discounted price if you buy more than three pairs, so get together with your friends and you can not only save on cost but also on shipping! Just a reminder that uniformity is an issue in marching band, so you must puchase Drillmaster brand black vinyl shoes - they are the only approved footwear for band members. 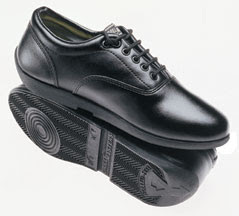 Guard members do not need to order shoes.